Adil Khan, Deputy Commissioner , Hailakndi district of Assam today reviewed the status of schemes and projects of different departments. Reviewing the progress at the monthly District Development Committee meeting at DC’s conference hall here, Deputy Commissioner Khan directed the PWD (NH) to expedite the work of Katlicherra bypass and Dholeswari bypass along with Jamira-Gharmurah road. Khan pulled up the Executive Engineer for the tardy progress of the road projects and directed him to complete the works at the earliest. Khan directed the Executive Engineer to supervise the works and to initiate action against the contractors for dilly-dally. The Deputy Commissioner cautioned that under no circumstances works on these projects may be further extended. 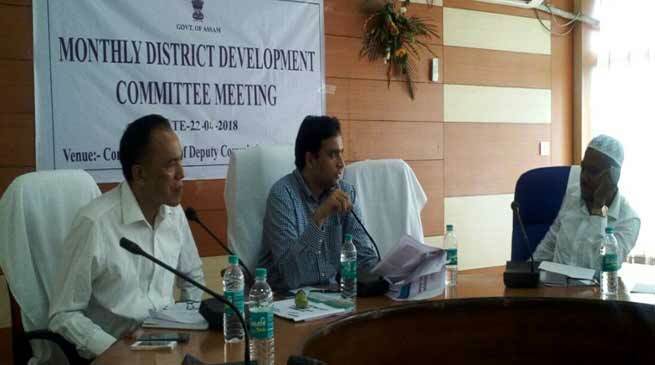 The Deputy Commissioner while reviewing the status of ongoing five numbers of PWD (Rural Roads) said that senior officers of Distt administration would inspect the progress on May 1. Khan also asked the PWD (Buildings) to complete the construction of Office of CO, Lala and Alfapur, Haj Bhawan and CHCs at Bilaipur and Kalunagar under CM’s Special Package. The Deputy Commissioner directed the Executive Engineer PHE Department to complete the building of individual household latrines to enable the administration to officially declare it as Open Defecation Free district. The Executive Engineer assured that the process will be completed within May 15. Khan also asked the PHED to expedite the mega World Bank funded piped water projects. Khan asked the APDCL to hasten the process of electrification of six selected villages under Gram Swaraj Abhiyan by April 28. He announced that Chairman, APDCL may visit Hailakandi for reviewing the progress of rural electrification. The Deputy Commissioner directed the Superintendent of Taxes and DTO to enforce the ban on illegal plying of trucks and on overloading. The Superintendent of Taxes informed that over Rs.4 lakh has been realized by way of penalties on 250 numbers of vehicles. Khan asked the Legal Meterology to verify the weights and measures in retailers, wholesalers, vendors, traders and Fair Price Shops so that no one can dupe the consumers. The Deputy Commissioner reviewed the status of IWT, Sericulture, Veterinary and Animal Husbandry, Cooperation, Assam Agriculture Marketing Board, Labour, Handloom and Textiles and other departments. It was decided to recommend action against the officers who were absent in the meeting. The meeting was attended, among others, by DDC, ADCs, Lead District Manager and district heads.